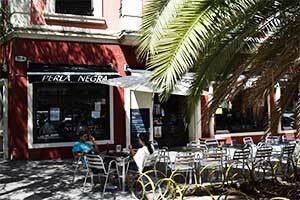 As your personal Valencia Guide to experiencing the city like a local, I must fill you in on one of my favourite places to take a leisurely stroll, have a coffee or beer at a street café, or enjoy a meal on a terrace — Avenida Reino de Valencia. This avenue, which is a main artery in the city centre, connecting the Gran Via Marques de Turia with the Turia Riverbed park, is at the same time spectacularly grand and cosily quaint. Avenida Reino de Valencia forms the boundary between two popular neighbourhoods within the central Ensanche district of Valencia– barrios Ruzafa and the Gran Vía. This strategic location gives it its unique character, sharing the vibrance of Ruzafa and the elegance of Gran Vía. 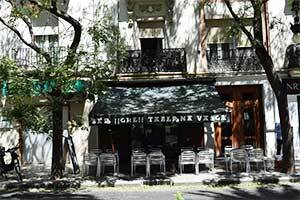 It is only a 2-minute walk from City Garden B&B, located in Ruzafa, Valencia. Avenida Reino de Valencia is cool and shady in summer, alive with everyday, neighbourhood activity all day long and stunning to an extreme at sunset. The buildings that line this avenue are an impressive collection of the characteristically ornate, low rise apartment buildings that were popular among the upper class during the last century. 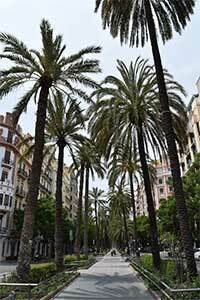 The centre of the avenue is a magnificent palm-tree-lined promenade that runs its entire length. Here you can always find neighbours to sitting and chatting on benches, walking their dogs, or just strolling beneath the stately fronds. There are are many good places to eat along this avenue, but I will recommend two that are my personal favourites. The first is Bar Ché – Taberna Vasca, Avda. Reino de Valencia 9. This is a traditional Spanish Tavern, founded in 1933. It is a family run establishment where every detail — the bullfight posters on the wall, the jovial waiters and the classic homemade dishes — adds to its authenticity. For lunch there is a specially-priced menu and for dinner I recommend tapas. Among the specialties are: ensaladilla rusa, croquettes, stuffed peppers, bacalao a la vizcaina, empanadillas and meatballs. To drink you must try the authentic sidra (cider) served the traditional way from a large wooden barrel. The second is Losviñedos, Avda. Reino de Valencia 9. This moderately upscale restaurant is quintessentially Valencian, offering a wide variety of rice-based dishes–the regional specialty. 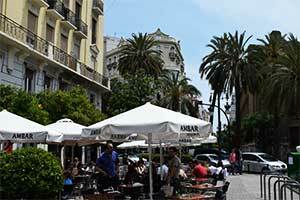 It is the type of place that is very popular with the locals, but doesn’t appear in Valencia guide books. Aside from the classic paella, the menu includes a broad selection of arroz meloso dishes prepared with different types of fresh fish and seafood. These soupy rice dishes, similar to risotto, are a favorite among the locals. 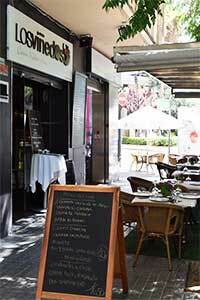 For a lighter meal, Losviñedos prepares high-quality, fresh, Valencian-style tapas and has a fine selection of local and national wines. 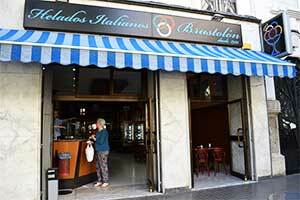 For ice cream I highly recommend Helados Italianos Brustolón, Avda. Reino de Valencia 10. This ice cream parlour is an institution, founded by Italian immigrants in 1935. For many, they serve the best artisan ice cream anywhere. Here you have over 60 flavours to choose from, and many change depending on the season. Among the most popular are mango, pink grapefruit and their specialty, Sicilian pistachio. For a leisurely coffee or beer I like the Perla Negra at Avda. Reino de Valencia 23. Its terrace is tucked under a large shady palm and is a great place to enjoy the laid-back, Ruzafa-vibe of the neighourhood. Inside the bar is reminiscent of “Friends”, complete with a cosy-corner sofa. In Perla Negra it is common to see people working on their laptops or reading the newspaper while enjoying glimpses of life in the barrio through the large picture windows. 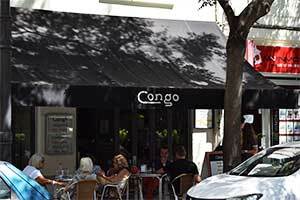 The other café that I recommend is a Valencian institution, Bar Congo, Avda. Reino de Valencia 51. Here the atmosphere is classic Gran Vía–relaxed elegance. It has two terraces, one right outside the bar and the other in the middle of the promenade, where you can find shade in the summer and sunshine in the winter. This is a very pleasant spot on the avenue to have just a drink or a simple meal. They serve breakfast through dinner offering bocadillos (sandwiches in a hard roll) and platos combinados (combo dishes). We hope this Valencia guide to Avenida Reino de Valencia will help you to experience the city as an insider. We would love to here about your adventures, so don’t hesitate to leave a comment below. Thanks for your comment. I´m glad you found the article useful. If you would like any more information on Valencia from a local’s perspective, don’t hesitate to contact me. You’re so cool! I don’t believe I’ve truly read through something like this before. So great to find another person with some genuine thoughts on this subject. Seriously.. thanks for starting this up. This website is something that is required on the internet, someone with a bit of originality! Thanks for your comment. Glad you have enjoyed our articles sharing what we like best about Spain and Valencia.